We were happy to partner with Ashley Covelli at Big Flavors From a Tiny Kitchen for this delicious and easy King Salmon Niçoise Salad Board recipe! Moink has several different cuts of each type of protein (hellooooo thick-cut bacon, leg of lamb, king salmon, and French ribeye steak! ), and the boxes are fully customizable. Each Moink box contains 13-16 pounds (!) of meat. 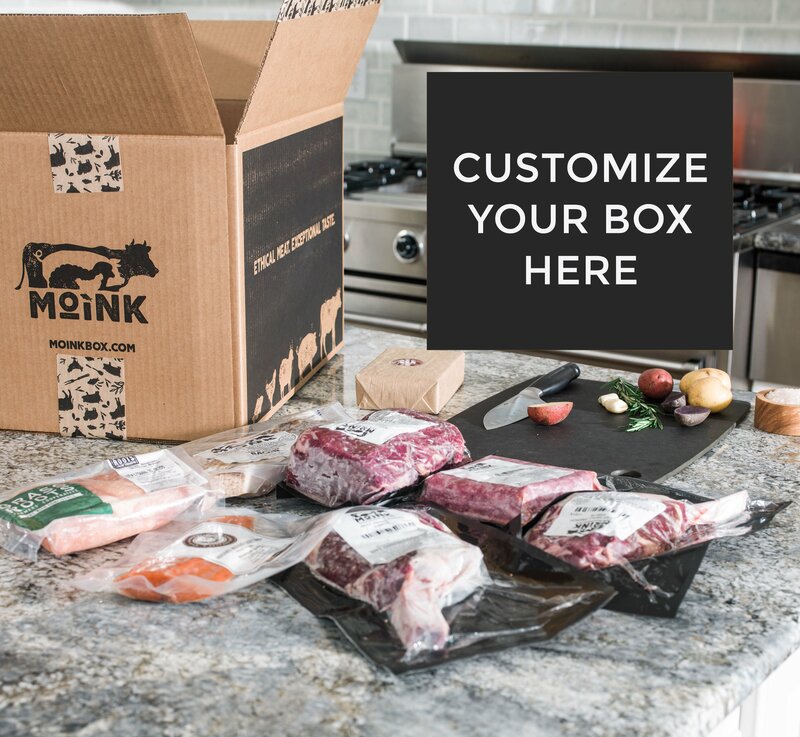 Moink boxes are currently $159, which ends up being less than $4.50 per serving. Shipping is always free, too, so you get a serious amount of bang for your buck. Feel free to add or subtract different items on your board. Having a nice variety of colorful veggies really makes the board special, but try not to stress over having exactly the items that I have on my board on yours. I haven’t everbeen able to find Niçoise olives, so I usually use kalamata instead. Shipping is always free! Go to www.moinkbox.com for more info. New to MoiNK. Spent an afternoon with my 85 year old mother cooking Martha Stewart’s Beef Bourgian with the beef chuck roast in my first box. I tried Martha’s recipe that uses a vegetable and herb bouquet wrapped in cheese cloth to roast with the beef and finishes with pearl onions and button mushrooms prepared in a separate skillet. Julia Child, herself, wouldn’t have gotten better results! I can’t begin to describe how savory and delicious it was. Truly, the beef absolutely melted in your mouth. I know I owe it all to starting with MoiNK’s grass fed beef. Everyone fought over the leftovers – even more delicious the next day. And, what a perfect dish to prepare this time of year. Made the house toasty warm and oh so fragrant while the first winter storm reared it’s head outside. My mother shared with my seven siblings what a beautiful day and beautiful meal we had. They shared with me that I was cooking Thanksgiving and she would be spending it here. Am I? Of course! I learned how to cook along side of the best. I love honoring her this way. After all, she taught us that so much more than good home cooked meals happen around the dinner table.